James Phillips, a saddler, lived here from 1807 to 1847. His name is scratched on a window in the adjacent kitchen building. In 1853, Thomas Blount Hill purchased the estate and proceeded to enlarge and improve the house. Hill added the western portion consisting of two rooms both upstairs and downstairs and the central tower, renovating the existing house and adding the large porches to create a picturesque Italian villa, which he named BelleVue. Impressively sited on a five-and-a-half-acre lot at the eastern edge of Hillsborough and standing back from the road on a slight hill, this Italianate-style villa was built around an earlier building. The house consists of two two-story, front-gabled sections with a three-story, hip-roofed tower rising between them. It has plain weatherboards, paired four-over-four wood-sash windows, and an interior corbelled brick chimney in each front-gabled wing. The main entrance, centered in the tower, has a fifteen-light French door with ten-light-over- one-panel sidelights and a three-part transom. It is sheltered by a one-story, hip-roofed porch that extends the full width of the façade and wraps around the right (east) and left (west) elevations. The porch is supported by paneled square columns flanked by Corinthian columns and there is a low wood railing with square balusters. There is a low railing at the roofline and a double-leaf door in a shouldered surround at the second-floor level of the tower accesses the porch roof. The third floor of the tower has an eight-light French door flanked by eight- light sidelights that opens to a small balcony supported by braces. The house has been enlarged several times at the rear. There is a two-story gabled wing at the left rear (northwest) with a one-story, front-gabled wing on its left (west) elevation and a one-story, hip-roofed section at the southwest where it connects to the main block. 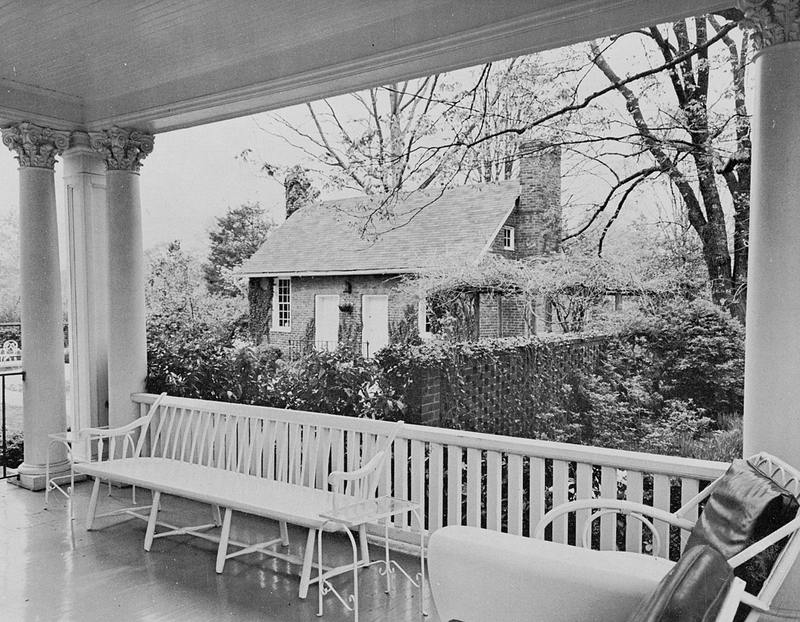 A two-tiered, shed-roofed porch on the right (east) elevation is supported by square columns and the first-floor level has been enclosed with screens. There is a one-story, hip-roofed section at the right rear (northeast). The house is sited on land that first belonged to James Hogg and was known between 1801 and 1807 as the "school-house lot." Samuel Chinny bought the land in 1799 and probably built the house that is now the eastern portion of the house, since a deed of 1801 mentions a house on the lot, but this is now no longer visible. This building consisted of three large rooms and a hall downstairs and two rooms upstairs. James Phillips, a saddler, lived here from 1807 to 1847. His name is scratched on a window in the adjacent kitchen building. In 1853, Thomas Blount Hill of Halifax County purchased the estate and proceeded to enlarge and improve the house. 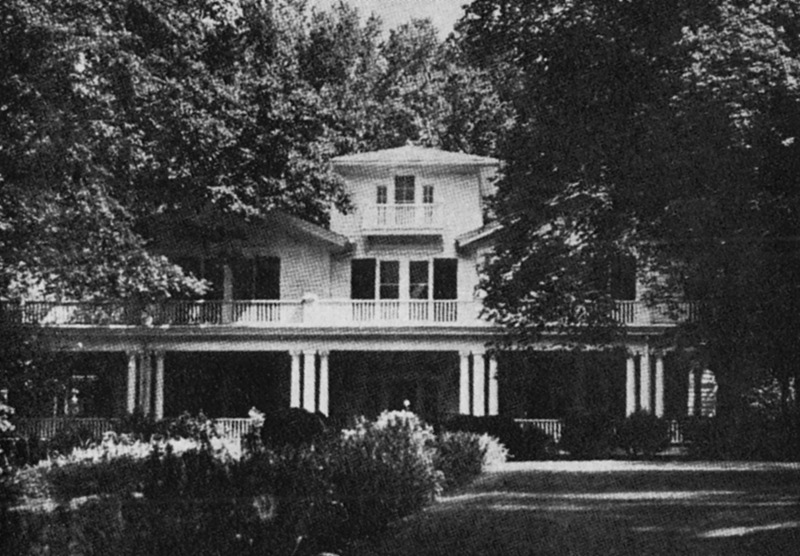 Hill added the western portion consisting of two rooms both upstairs and downstairs and the central tower, renovating the existing house and adding the large porches to create a picturesque Italian villa, which he named BelleVue. 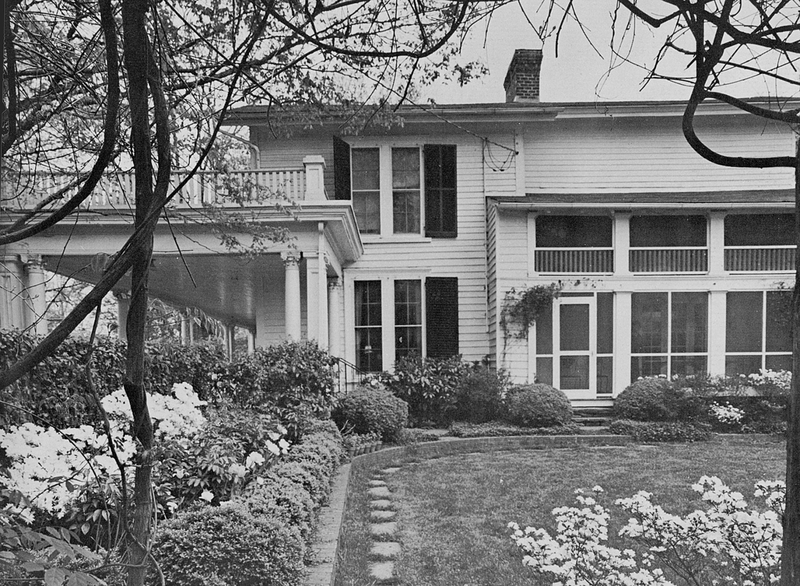 The house was passed to Thomas Blount Hill's daughter, Mary Alice, who married Joseph Cheshire Webb, Sr. and to their son, Joseph Cheshire Webb, Jr. and wife. James Phillips Kitchen, c. 1807 - This handsome one-and-a-half-story brick kitchen, located on the east side of BelleVue, is one of the earliest surviving brick structures and one of the finest early kitchens in Hillsborough. It was built by James Phillips around 1807 when he purchased the "School-house lot"; his name is scratched in one of the windows. The two-room, side-gabled kitchen is laid in one-to-five common-bond brick and has exterior end brick chimneys, nine-over-nine wood-sash windows on the east and west elevations, four-light windows in the gables flanking the chimneys, and two six-panel doors on the west elevation, all with flat arches, and a wood shingled roof. The kitchen chimney is ten feet wide at the base with a built-in oven and an arched fireplace. Traces of brick foundations are evident to the north of the kitchen and may have been slave quarters.